Like a slime mold advancing across a rotten log, the Luminous dancers moved slowly, almost imperceptibly at times. There were no apparent cues guiding them on their collective journey; they communicated via invisible, energetic signals. In the beginning, the dancers, silhouetted by an eerie grey-green light, simply walked along a horizontal path. They held their hands in a spherical shape, as if carrying a tiny ball of light. They all mysteriously found stillness before advancing across the stage, guided by an inner connection. Musician Stephen Fandrich’s presence added shades of depth to Luminous. His work was so physical that his bunned hair slowly found its way down his shoulders, and his face became covered in sweat. He brushed his fingers delicately across gongs, slowly crushed empty plastic bottles, and arrhythmically tapped on xylophones. Most strikingly, Fandrich used an ocean drum. At first, the sounds were quiet, mirroring the subtle shuffling of the dancers. But as the dancers began advancing like an oncoming tide, Fandrich crashed the waves by rising up on his knees and spiraling the drum above his head. The dancers’ shuffling climaxed to running and culminated in a cluster of bewildered stillness. A puff of white powder rose to the heights, along with Fandrich’s final sound wave. These amazing dancers all draw influence from Diego Piñon. 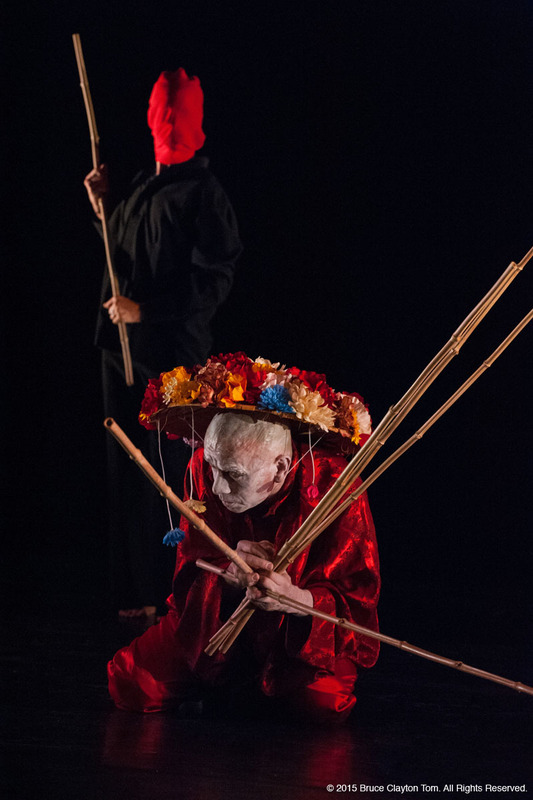 International artist, facilitator, and researcher, Piñon has been developing his own version of butoh, Body Ritual Movement, since 1975. He utilizes ritual to reach his yin-and-yang goal of releasing and embracing his “resrictions.” His triptychal Puente-Bridge-Parhijtsikuni provided a powerful example of this. Sheri Brown and Christopher Mankowski set the stage for each section. Dressed in loose black clothing, the duo walked specific patterns, then worked together to slowly unroll a long, thin red carpet from each of its ends. They emerged between each section to re-roll the carpet, move it further downstage, and unroll it again. There was nothing hidden from the audience in these ritualistic moments. The first section illustrated the voluntary release of attachment. Piñon entered with a marvelous branch that arched perfectly over his bent back, sent rays of wood like huge antlers from the top of his shaved head, and ended in a thick tail that curved away from his coccyx. He interacted with the branch as if it were a burden, a yolk, even a loved little baby—before eventually abandoning it. He seemed to simultaneously hate and love his earthly attachment. As a rejoicing Handel piece played, he exited on the red carpet while untying red strings from his tunic. Next, Piñon embraced the darker side of humanity. He emerged in traditional Mexican festival garb, and a devil mask with a thick, protruding, red tongue. He moved like a dog, then a tortured human, before stepping onto the red carpet and removing the mask. He stared down his devil then thrust his pelvis into it. Instead of abandoning it like he did his branch, however, he clung to it, bent over it, and carried it offstage. The final section featured Piñon in red Japanese silk pajamas with a platter full of fake flowers on his head. He carried five bamboo sticks which were ritualistically stolen from him by Brown and Mankowski, whose faces were covered in red cloth. In this section, Piñon’s face revealed shock and grief at the loss of his attachments. With no more possessions, he rolled up the red carpet, from one end only and in the opposite direction as before, placed it inside his tunic, and slowly backed up into the giant branch upstage. His elbows were stuck to his sides and his hands drew lines and arcs in the air in front of him. The lights faded out on his squatting figure, a look of resignation on his face. Bioluminescence. Global body. Ritualistic release. 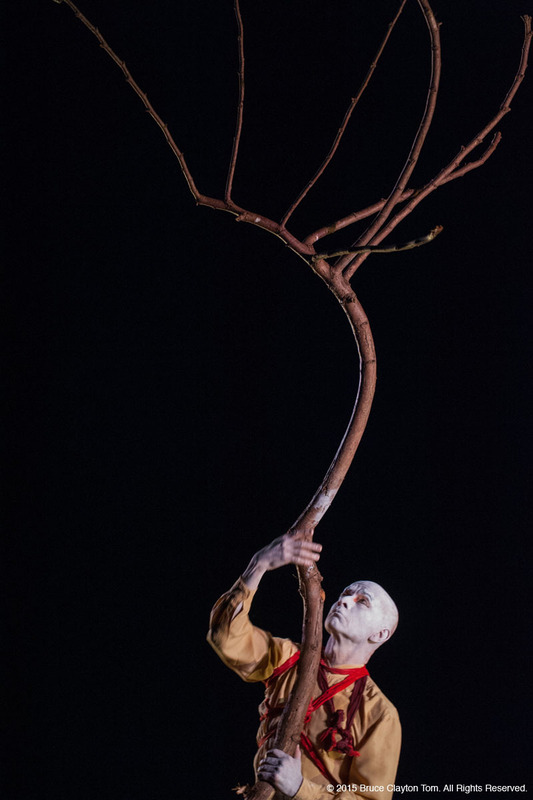 This weekend, the Seattle Butoh Festival brought local and international masters together in a once-in-a-lifetime culmination of meditative energy. 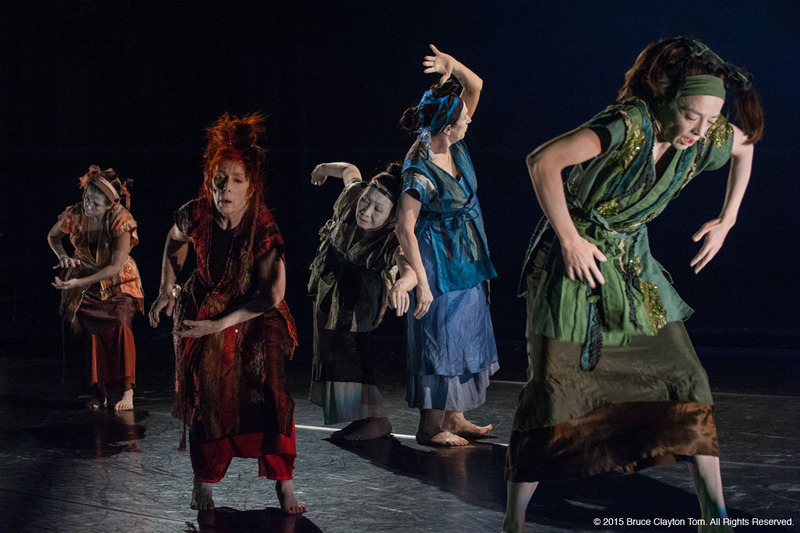 Though this was a one-weekend event, there are other ways to stay up to date with the butoh world. DAIPANbutoh Collective performs and teaches in Seattle throughout the year, and Diego Piñon shares his Body Ritual Movement all over the world. Beautifully written piece. Hightower dances with her words and makes the reader and the performers re-live the magic moments of the performance. Seattle is lucky to have a dance critic that truly understands dance.